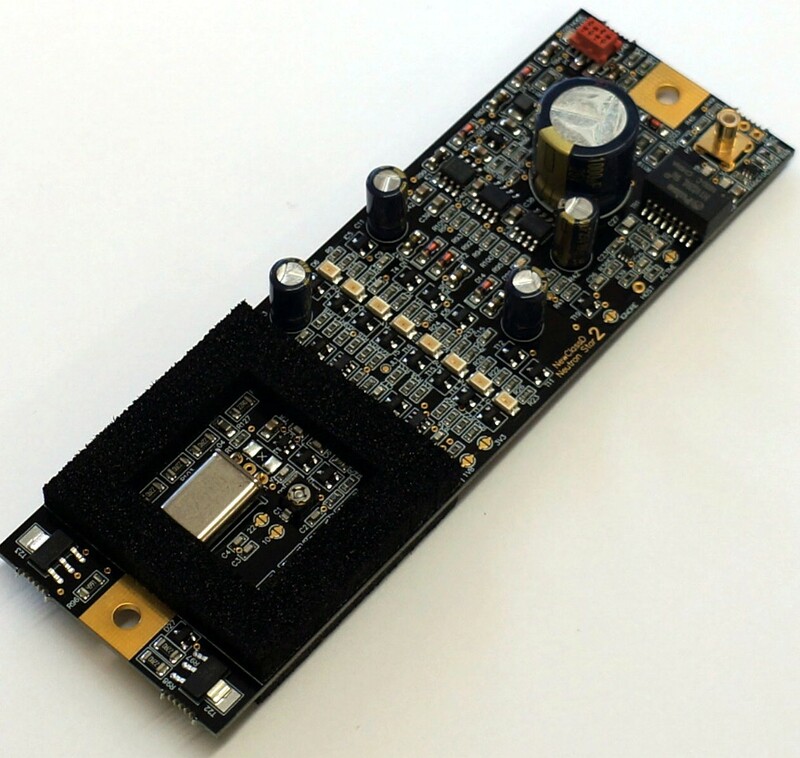 Ultimate Performance Audio Reference Clock with Gallium Nitride voltage reference. This reference clock is placed inside your CD player, DVD or Blu-ray player, asyncronous D/A Converter, USB receiver, audio PC motherboard or other clocked digital audio equipment. It has the potential to drasticly improve the sound quality of your digital audio equipment. Every digital audio equipment is already clocked from the factory, however most of the times this clock is a cheap and noisy type, based on CMOS gates or a noisy 7805 regulator, or most likely both. In the D/A Converter of your digital player, the voltage reference determines the S/N ratio when the output signal is a stable DC voltage. However when the signal is in transient, the voltage reference becomes less important, and it is now the clock source that determines the S/N ratio. If there is too much noise you hear it as a narrow and flat sound stage. Therefore it's surprising that so few OEMs seem to offer much energy on this point. We do, and you can fit this clock source inside your equipment, and get immediate improvement. We have two different clocks, the Neutrino, a small form factor and low cost clock with still decent performance. And for ultimate performance we have the Neutron Star 2, a hand adjusted precision clock, with temperature control, and an abundance of support features to get ultimate performance from your digital sound equipment. Clock and power supply cables are included. How does it affect the sound? A reference Clock is installed inside an audio player, and will have the effect of cleaning up the sound stage. This means the sound stage will spread out correctly, and make it easy for you to feel where the instruments and artists are placed. It essentially turns music from background noise to a living experience. Most digital audio equipment is fitted with a noisy clock from the factory, running on the same power rail as the rest of the (noisy) electronics. This will give a narrow and blurry soundstage. Kind of like if the whole band in your music were standing inside a phone booth, and you were trying to listen outside. You cannot pinpoint if the drums are in front or back. So there is potential for improvement. A reference clock is step #1 in upgrading a digital player, to reach clean and living digital sound, which will let you really enjoy the music instead of turning it down. You can apply a reference clock to a cheap or expensive player with the same positive result. We guarantee you, that you will be surprised and amazed how much improvement in sound you can get from this clock. A whole new type of Voltage Reference. The voltage reference is the most important part for making the clock's performance. If the reference has any noise, it will find it's way into the clock signal, which will lower the performance. In our previous clock regulators we used the LM329, one of the best single chip voltage references in the world, when it comes to low frequency noise performance. But there are ways to push the noise level even lower, but it takes some effort. A special type of green LED, based on a Gallium Nitride crystal has been found to have exceptional low noise, but unfortunatly also lower temperature stability. Therefore we spent a lot of research trying to find a way to compensate for the temperature drift of the Gallium Nitride crystal, without sactificing any noise performance. So we ended up with a total of 63 components to replace just the one LM329 chip, with the sufficient stability and noise rejection. This while keeping the extreme good noise performance of more than 30 times better than a standard 7805 regulator. Can the noise performance be achieved by using decoupling capacitors? This seems like a logical and cheap solution, but that would only work at higher frequencies like above 100 Hz, while the most hostile noise is in the lower frequencies. Therefore there are no available standard references with low enough noise, to achieve the outstanding performance that has now been achieved with Neutron Star 2. The noise is so low, that a capacitor will not even improve the noise, and therefore we didn't use the OSCON capacitors we used in the earlier version. They have no effect in this reference. 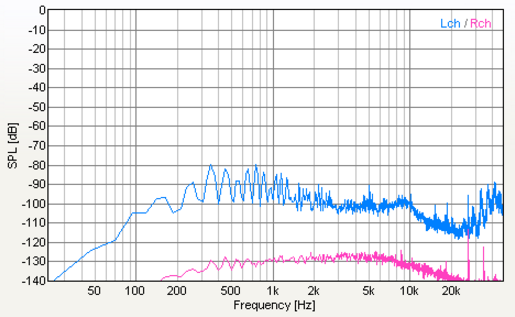 Note the scale is different on the two readings, and the noise in both readings are amplified 1000 times or 60dB. 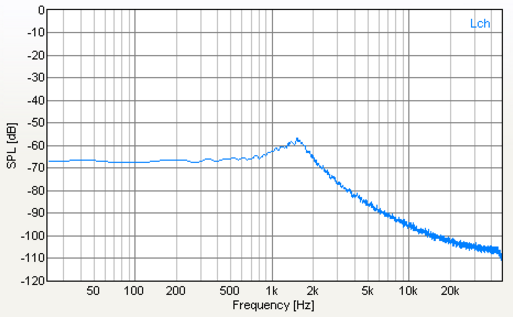 So the absolute values are -130dB and -102dB under 2.83V respectively. Temperature stability and support features. The Neutron Star 2 has an on-board stabilized temperature island, which will keep the frequency stable at all normal environmental conditions. When the thermostat is locked, a green LED will turn on, indicating the right temperature of the crystal has been reached within +/- 0.5 deg. C. At the 15V power supply connector there is a small red LED which will light up in case any noise is detected on the power supply line. This is measured before the on-board regulators, and may not affect the performance of the clock, however you have a warning to let you know something should possibly be done to remove noise on the power supply. There is a HOST function on the NS2 clock. Let's say you have an external power supply for the Neutron Star 2 (recommended), and it will run with power continously. But maybe your DAC or digital player is not always on. Then you need to switch the clock off whenever the digital player is off. This can easily be done with the HOST function. Simply connect the 3.3 or 5V supply of the host player to the NS2 HOSt terminal, and activate the HOST function (see instructibles). Then the clock will only be active on the output whenever the player is on. The output clock amplitude has to fit with the host machine, therefore a setting is possible on each clock, to get 5V (default), 3.3V or 1.8V (for Raspberry Pi3) clock amplitude. The NS2 has 2 different outputs, and they are completely isolated from each other, and from the power supply plug (by at least 300V AC potential). The main output is a 50 Ohms COAX output, which is potential shifted to the set positive voltage. This signal connects to the input of the clock gate on the host board. The Active output is the same clock signal, but the first gate is actually placed on the NS2 board, giving in some cases a better compatibility to the host (and thus better sound in some cases). This might be used in cases where the host player uses a metal can oscillator. Here you connect 3.3 or 5V DC from the host supply to the NS2 Active output, and then you have a CMOS compatible digital clock output signal, just like the metal can oscillator. But in this case you can only run up to 5-7 cm. of wire to the player. Better 3 cm if possible. 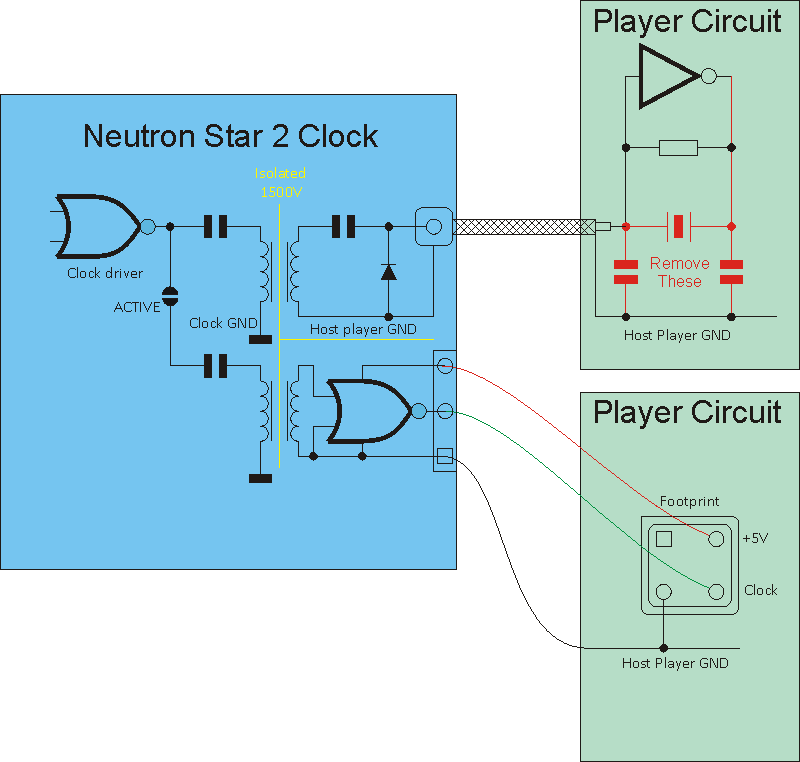 The Neutron Star 2 Clock uses a Colpitts oscillator, famous for low noise, and usually found in sensitive receiver equipment. This type of oscillator does not transfer power rail noise to the clock phase, like a standard oscillator based on the simpler and more noisy Pierce type '74HCU04 inverter' oscillator, as found in most OEM equipment. Not only is the gate not exactly a low noise amplifier for weak crystal signals, but also half of the noise on the +5V rail is coupled directly on top of voltage on the input pin. But it is cheap, and therefore used many places. In Neutron Star 2 we go another way, and try to make the best possible product, without compromising on important places. A new special performance feature, compared to earlier versions is that we no longer use a silicon RF transistor in the oscillator, but now instead a germanium ultra low noise transistor. This type of transistor is extremely stable, and normally used in professional GPS receivers. To understand why this feature is an absolute must in a quality clock, we can compare the install circuit with and without isolated output. The clock installation of a typical clock with direct output will form a GROUND LOOP, causing noise from all the circuits in the host machine to most likely connect through the clock signal wire. This destroys the clock unit's performance. In the Neutron Star 2 we use ground isolation (up to 1500V AC) to eliminate the ground loop. Now only a very weak current flows in the ground wire, and the noise problem is eliminated. The ground of the clock gate in the host machine may still have some noise on it, however this becomes common mode noise, and will not affect the clock signal. Accuracy from 20 to 50 deg C: +/- ppm. Power Supply (Optimal): 15.00 Volts DC 150 mA. Power Supply Recommended: 12.00 - 20.00 Volts DC 150 mA. 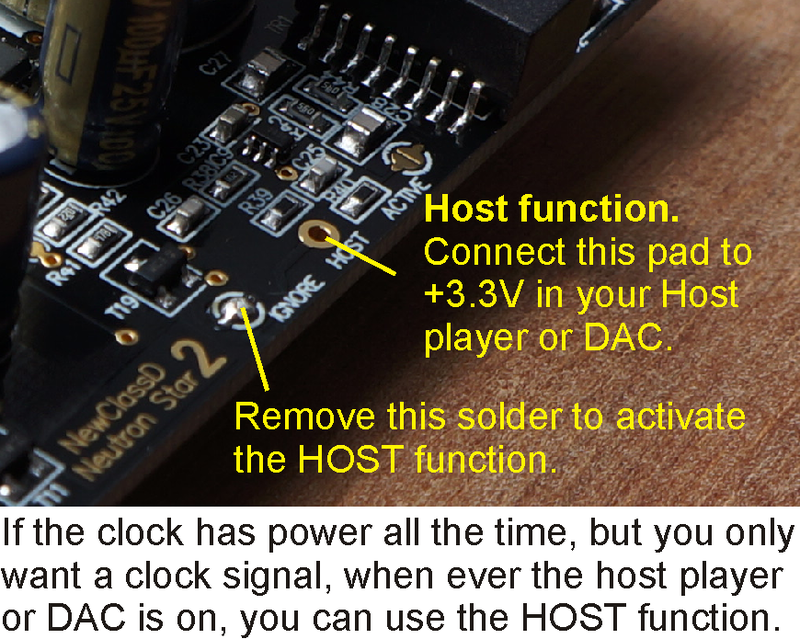 To install the clock, you need to set up the clock module to 5V, 3.3V or 1.8V, then connect the clock signal wire to the host player's injection point. (More Info...) and add +15V power to the clock module. That's pretty much it. Note the two GND wires are already connected on the board, so only one of the wires need to be connected externally, but both may be connected. The same goes for the two +15V wires. We recommend 15V DC supply voltage, however it can run on lower voltages, like 12V, but the thermostat becomes somewhat slower in achieving lock. 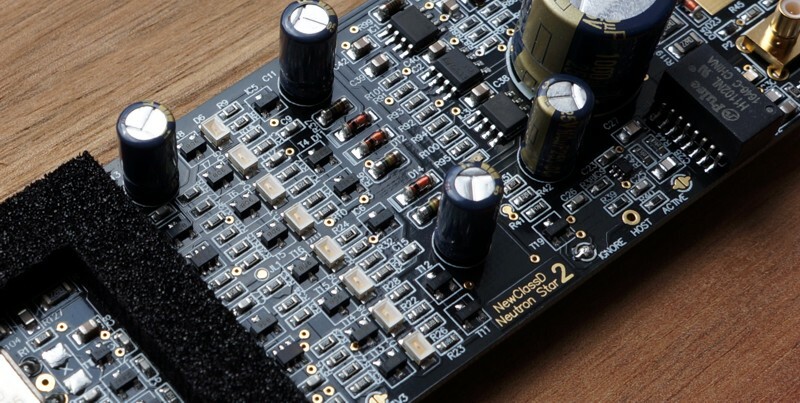 The NS2 has two output options. The "Normal" COAX connected output that moves the clock signal in shielded cable. This cable should be kept as short as possible, but the clock signal will survive up to 50 cm.  of wire, and will not get corrupted by airborne noise. You may use any of the two outputs as you find best, or even both. The two outputs are completely separated, and one can be connected to say the DAC while the other is running the transport. The active clock is a digital clock output. It requires power supply voltage of 3.3V or 5.0V from the host machine, this way you are sure the voltage of the clock signal will match the host machine's requirement. The clock wire itself must be kept very short, for lower frequencies less than 10cm, and for higner frequencies, 3-4cm tops. The clock signal will not survive long stretches of wire in this configuration. On the other hand you may get a "cleaner" connection to your host machine if you can get the wire short enough. Connect the HOST terminal to +3.3 or +5V of your host equipment. This allows the clock to see if your equipment is on or not. 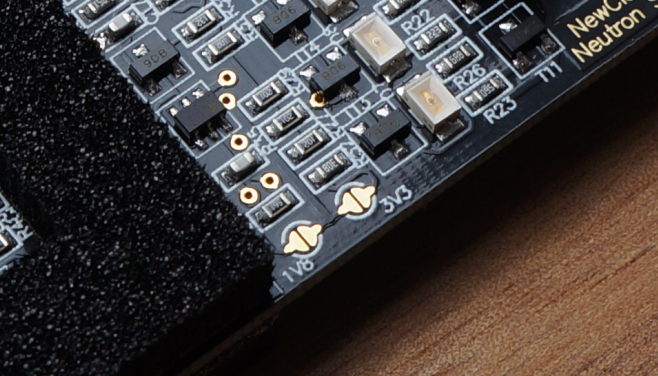 Remove solder from the "IGNORE" pad, to activate the HOST function. Now the clock will switch off whenever the host player is off. 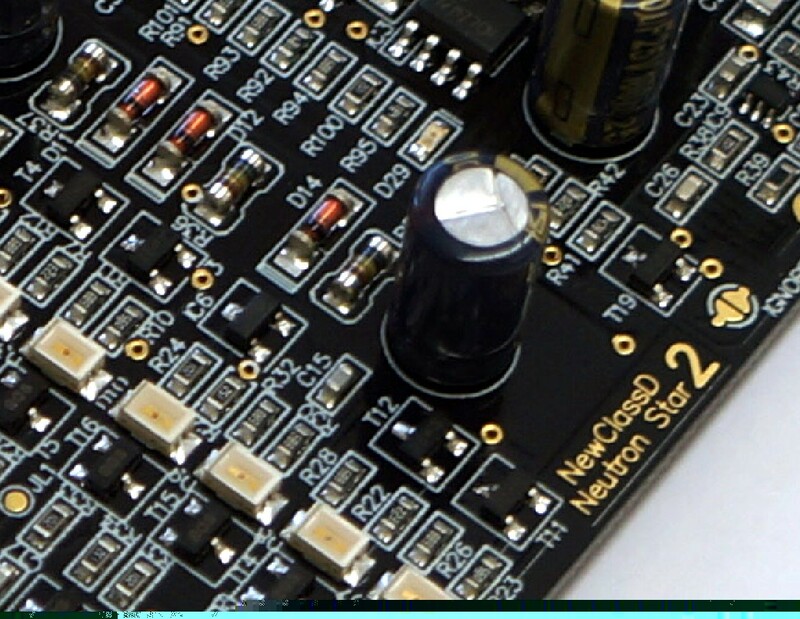 The Neutron Star 2 can deliver a clock signal of 1.8, 3.3 or 5V peak to peak. The default value is 5Vpp. 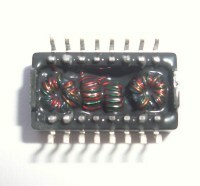 If you require 3.3V (most modern equipment) then add solder to the pad labelled "3V3". 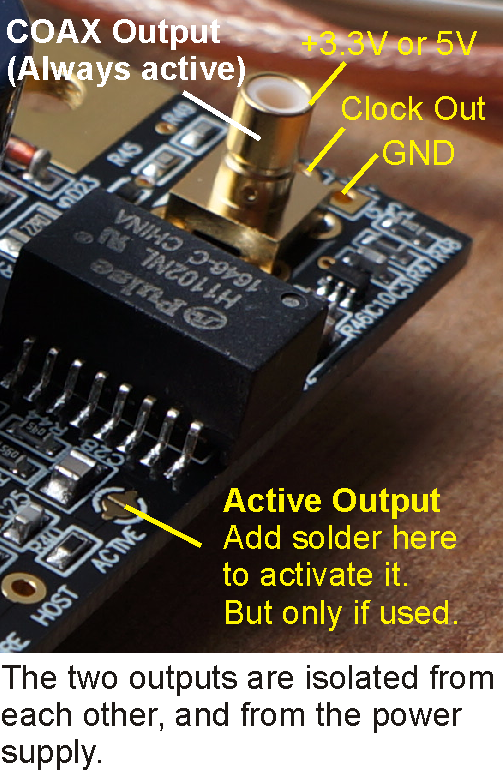 For 1.8V output signal, add solder to the pad labelled "1V8". Only add solder to ONE pad at a time. If you wish to change the voltage, you can of course remove solder from whatever pad you have used before. No solder gives the default 5V output signal.